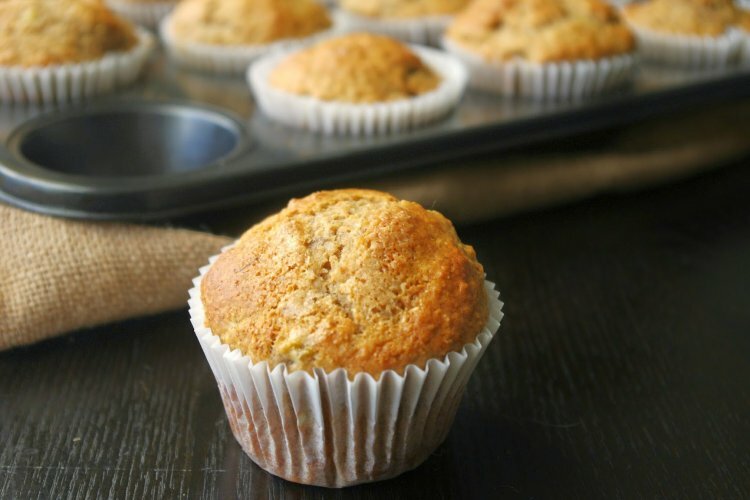 This is a great, moist and yummy muffin and meets all my requirements: super-fast to throw together, satisfyingly delicious, on the healthier side with low fat, freezes perfectly, and delicious with a cup of coffee or a cold glass of milk! It serves as breakfast on the go with a fruit on the side, or a satisfying mid-afternoon snack. It can also be packed in school lunches for the kids (when made with Rice Krispies instead of nuts). Preheat the oven to 350*. Line 12 muffin cups with paper liners and set aside. 1 1/2 c. white whole wheat flour, 1/2 c. light brown sugar, 2 tsp baking powder, 1/4 tsp baking soda, dash salt, 1/2 c oats, 1/2 c chopped nuts or Rice Krispies, 1 1/4 tsp cinnamon. 1/3 c oil, 2/3 c natural (no sugar added) applesauce, 1 c orange juice, 1 tsp lemon juice, 1 egg, 1 tsp vanilla extract. Mix the dry and wet ingredients together, till all incorporated. As with all muffin batters, do not over mix or muffins will be tough. Spoon the batter into the prepared muffin cups. Bake for about 22 minutes, till center of muffin is dry. Remove from oven and cool on wire racks.